P A Safety Management Limited is committed to achieving environmental best practice, preventing pollution and reducing waste in our administrative office activities. We aim to continually improve our environmental performance by setting and monitoring our objectives and targets as well as conducting internal reviews and audits. 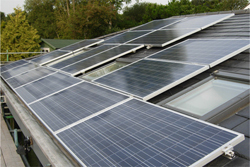 Our administrative office is located in the South Cambridgeshire countryside, which affords us the space to have solar panels and a rainwater harvesting system. Our solar PV system has an estimated annual generation of 2972 kW and powers our office and equipment. Needless to say, we love sunny days! 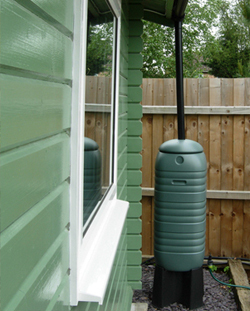 Two water butts with a capacity of 100 litres each are connected to our office's gutter system, allowing us to harvest rainwater for our plants and shrubs. We grow bee-attracting plants because we believe in the importance of biodiversity and recognise that bees are beneficial to the environment by ensuring that food crops are pollinated. This environmental aspect is another reason why the bee is featured in our logo! Other initiatives to reduce our environmental footprint include the use of low mercury content bulbs, motion-sensor lights and natural lighting, the recycling of paper, plastic, glass and cans as well as the use of sustainable materials, such as our bamboo flooring. We encourage the use of electronic files rather than hard copies and only print documents when necessary. 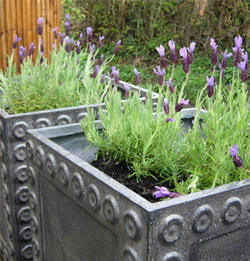 We actively encourage environmental awareness amongst our team and suppliers. We are proud to use suppliers that are aligned with our environmental sustainability values. Our website designers, Unstuck Design, have a clear green policy and use solar powered servers to host our website. That's right, our website is powered by nothing more than pure sunshine! In addition, Unstuck Design are able to report back to us on the estimated total CO2 that has been consumed by users accessing our website, based on our website traffic. We offset this amount to support environmental charities. Last but not least, we believe in the long term benefits of environmental management and that this concerns the welfare of future generations. The environment is a gift we inherit from our ancestors and borrow from our children. We believe that credible and fundamental change can take place through environmental initiatives. For this reason, we regularly make donations to environmental charities.